This is the professional responsible for the production of chocolate from cocoa. It is the person that accompanies the entire process, from the planting of cocoa to the manufacture of chocolate bars. The chocolate maker knows how to differentiate the quality of the grains and origins (terroir and harvest) and needs to be always updated about the innovations, that never stop. Nowadays, for example, it is possible to find grains from the organic market and there is already an offer of handmade chocolates called "bean-to-bar" (from grain to bar). The "Chocolatier" or "Chocolatière" (in the feminine) is an artist who uses chocolate as a base for the work. The best way to define chocolatier is as an artist who has the talent to transform chocolate bars into perfect pieces of art, through processes known to those who already works in Pâtisserie, such as the tempering. He manages to create sweets and desserts with different textures and flavors and is a chocolate gourmet. With the advanced knowledge of culinary techniques, chocolatier has as main characteristic the use of creativity. The Confiseur is the professional that creates chocolate from the chocolates, truffles, sculptures of chocolate and many other delights. He also has abilities to produce pieces and sweets made of caramel, sugar, syrups, jellies, and candy. The difference between the Confiseur and the Pâtissier is that it produces recipes that go into the oven, and does not necessarily only work with chocolate. He is able to make bread, pies, cakes, cupcakes, among others. At Le Cordon Bleu, Pâtisserie students also learn classic French desserts such as petit gâteau, croissant, and macarons. This can be considered an even more delicious experience. After all, who would not like to work eating chocolate? But there is much to study to assume this position. This professional needs to develop a keen sensitivity to distinguish tastes, odors, and textures, with the critical ability and technical knowledge to make their assessments. The taster can also join working groups to develop new products and innovation processes. Would you like to create chocolate art? 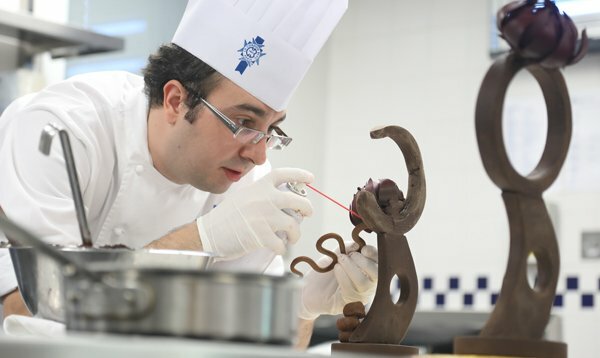 Discover Le Cordon Bleu's Pâtisserie and be an expert!